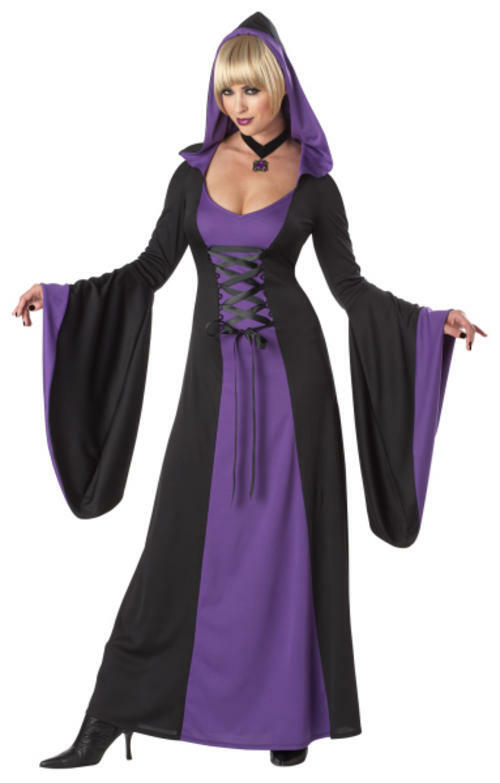 This fantastic Ladies' Deluxe Purple Hooded Robe Costume is perfect is you want to look like a wicked witch or a sinister sorceress and spook the kids on a night of Trick or Treating. The vampiress outfit features a deluxe material long black robe with long, oversized sleeves which gives a dramatic look. The robe is designed with a contrasting purple panel to the front decorated with a lace-up, black ribbon section. To complete the look is a black hood with purple lining so you can cover up in the chill of the night.. Perfect your vampire costume with this deluxe robe and head to a Halloween fancy dress party looking sinisterly seductive.